Use the Playground at the bottom of this page to find the best values for your panorama. 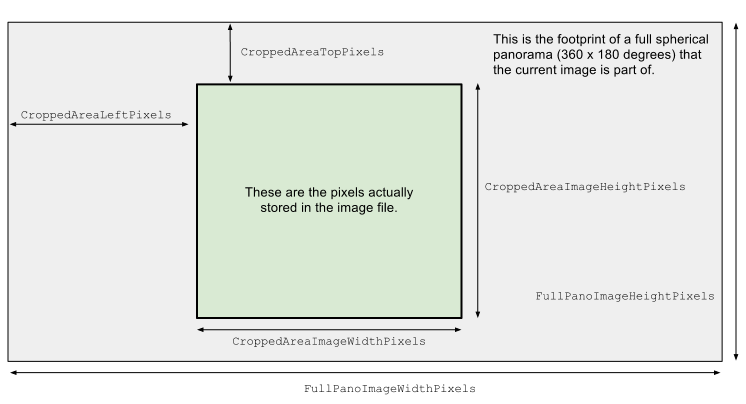 The Full panorama width / Full panorama height ratio must always be 2:1, Cropped area width and Cropped area height are the actual size of your image, Cropped area left and Cropped area right are used to define the cropped area position. More information on Google documentation. If you created your panorama with a mobile phone or dedicated 360° camera, it should already contain the correct XMP data. Otherwise you can inject it yourself with tools like exiftool. You can also directly pass the six values to Photo Sphere Viewer with the panoData parameter. Use this demo to find the best values for your image.